The objective of this study was to identify quantitative trait loci (QTLs) associated with grain quality in rice. 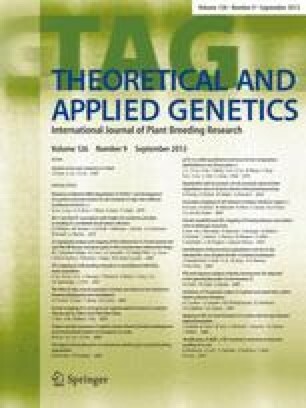 Two hundred eighty-five BC2F2 families developed from an interspecific cross between cv IR64 and Oryza rufipogon (IRGC 105491) were evaluated for 14 seed quality traits. A total of 165 markers consisting of 131 single sequence repeats and 34 restriction fragment length polymorphism markers were used to create a genetic linkage map spanning the 12 rice chromosomes. Twenty-three independent QTLs were identified using single point analysis, interval mapping, and composite interval mapping. These loci consisted of one QTL for filled rough/total rough rice ratio, two for grain density, one for percentage of de-husked rice grains, two for percentage of green rice grains, three for percentage of damaged-yellow rice grains, two for percentage of red rice grains, one for milled rice recovery, three for head rice recovery, four for broken rice grains, two for crushed rice grains, one for amylose content, and one for gel consistency. For most of the QTLs identified in this study, the O. rufipogon-derived allele contributed an undesirable effect. For amylose content and gel consistency, the O. rufipogon allele may be useful in an IR64 background, depending on the cultural preferences of the consumer. Careful selection against the regions associated with negative effects will be required to avoid unwanted grain quality characteristics during the development of improved varieties for yield and yield components using introgressions from O. rufipogon. We would like to thank Suismono at the Sukamandi Research Institute for Rice for the grain quality data, F. Onishi for technical assistance in the greenhouse, M.J. Thomson for editing the manuscript, and L. Swales for the formatting. A PhD fellowship to E. Septiningsih and much of the grain quality evaluation in Indonesia were funded by the Rockefeller Foundation, and a Postdoctoral fellowship to E.S. was funded through NSF Plant Genome Award DBI-0110004.